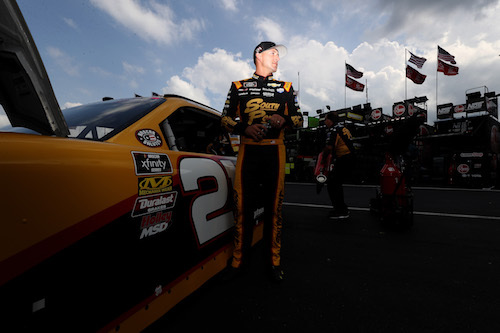 NASCAR Xfinity Series driver Daniel Hemric lost his points lead as the result of a 20-point penalty after the Kansas Speedway race weekend that included the Kansas Lottery 300 Xfinity Series race on Oct. 20. Hemric’s No. 21 Richard Childress Racing Chevrolet didn’t meet post-race height requirements in inspection after the Kansas race. NASCAR cited violation of section 20.17.3.2.1.2.a of the 2018 rule book in the weekly penalty report it released Wednesday. After finishing second at Kansas, Hemric had a nine-point lead on Elliott Sadler. After the penalty, Sadler leads the standings by one point. Other penalties resulting from the violation included a 10-point deduction for the race team and a $10,000 fine and one-race suspension for crew chief Danny Stockman Jr.
Three races remain in the 2018 Xfinity Series season. The series has the upcoming weekend off before returning to action Nov. 3 at Texas Motor Speedway. NASCAR also issued two fines for loose or missing lug nuts at Kansas. Chad Johnston, crew chief on the No. 42 Chip Ganassi Racing team of Kyle Larson in the Monster Energy NASCAR Cup Series, was fined $10,000 after the Oct. 21 running of the Hollywood Casino 400. Randall Burnett, crew chief on the No. 2 Richard Childress Racing team of Matt Tifft was fined $5,000. Wednesday’s penalty report also included an indefinite suspension for James J. Bender for violation of NASCAR’s substance abuse policy. Bender was listed as a tire technician on the No. 31 Richard Childress Racing team roster for the Hollywood Casino 400.